Isle of Jura Distillery have just increased their collection by introducing a 30 Year Old Single Malt Whisky called The Standing Stone (Camas an Staca in Gaelic). Jura Distillery Manager, Willie Cochrane said “ The standing stones have mysteriously stood the test of time on the island, so it’s only fitting that we create an aged Whisky in their honour. This dram has been matured in American white oak and it’s last 3 years in the finest Oloroso Sherry Butts from Gonzalez Byass, what a way to spend 30 years sleeping and aging to perfection. 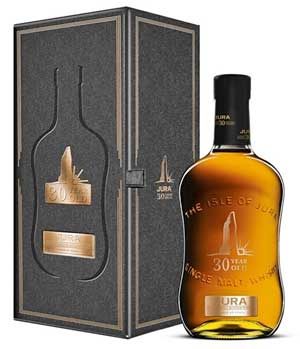 Isle of Jura Single Malt Scotch Whisky – 30 Year Old, ‘Camas an Staca’ 44% Alc/vol 70cl. Nose…Sweet Caribbean fruit, honeyed toffee, a little espresso coffee, apple skins, the sweetness is king in here, mist of ocean wave tops. Taste…Sweet fruit is a big hit, chocolate covered coffee beans, sherry soaked raisins, really mouth filling, a delight. Finish…Rich dark chocolate, even Terry’s chocolate orange, sweet lingering, long finish. 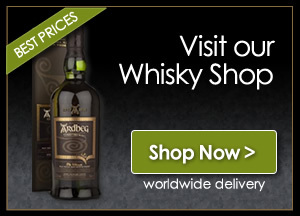 This is a dram of elegance and character, to be sipped gently with only a teardrop ( at the most ) of water, if you must. This new addition will be available in December and the RRP is £350 per 70cl bottle, Christmas is coming and what a gift this would be. Well done to Willie and all at Jura Distillery for producing such a classy and elegant Single Malt.